IMAGE: West Indies fast bowler Jerome Taylor. Photograph: Paul Kane/Getty Images. 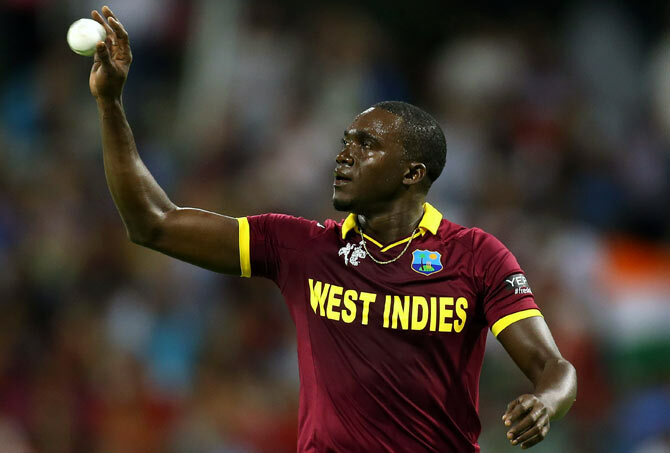 West Indies pacer Jerome Taylor has bade adieu to Test cricket after a 13-year long international career but will be available for selection in the shorter format of the game. The 32-year-old, who took 130 wickets in 46 Tests, was not considered for the squad which will play against India in the four-Test series after he gave a ‘formal notification’ of his decision to retire, the West Indies Cricket Board said in a release. Taylor had made his international debut against Sri Lanka in 2003 and played his last international test series against Australia in January this year. Plagued by injuries, the Jamaican had spent almost five years out of the Test side between 2009 and 2014. His best bowling figures are 6/47 against Australia at Sabina Park in 2015. The other three were against India, Pakistan and England. He has had four five-Test wicket hauls in his 13-year Test career. His top score was 106, batting at number 8 against New Zealand in 2008.